Get 15% off your order if you buy 3 boxes of Cohiba Siglo I box of 25. 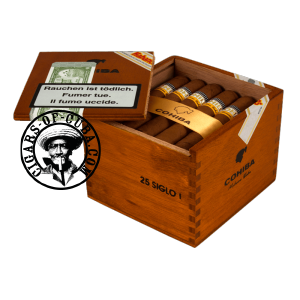 This discount only works with Cohiba Siglo I boxes of 25. Use the code SIGLO15 to get discount added on check-out. Don’t forget to add the code during check out! We will not add the promo code for you. This little cigar is a triumph of its genre and in tune with the times. It offers a steady and even burn. The blend is typical Cohiba Siglo line, beany and spicy, but the Siglo I surprisingly also plays with touches of saltiness. This Tres Petit Corona is a relaxing and fresh cigar that enjoys sharing its blend with the smoker. The more experienced aficionado will get more out of the blend, but this cigar can be enjoyed by all. By it's very composition, this cigar offers a milder smoke, as it contains fewer amounts of the leaves that give strength to a Cuban cigar. This cigar burns very well. It delivers cedar woody notes with hints of cocoa aroma. The final is marked by a touch of spiciness. It ends on hot notes due in part to the short size.